For three years now, YouTube stars from across Europe have gathered in Brussels to share their passions, amaze people with their talents, and celebrate their achievements at the Europe on Stage event, hosted last week by Brussels’ BOZAR Centre of Fine Arts. Europe on Stage highlights the diversity of talent in Europe, and demonstrates YouTube’s unique power to drive positive social change and create economic opportunity, as well as entertain. The event featured several YouTube stars who performed in front of a live crowd of fellow creators, fans and other invitees in Europe’s political capital. We saw fancy footwork from acclaimed dancer Sergei Polunin, as well as Wass, the French-Algerian football freestyler who gave us a new take on the beautiful game. And Marina Satti got everyone in the groove with her unique combination of Greek folk music and contemporary beats: Her song Koupes has had over 16 million views. She wasn’t the only Greek person in the lineup. European Commissioner for Migration, Home Affairs and Citizenship, Dimitris Avramopoulos, spoke in a video message about the cultural values that bring Europe together, saying that “we need international, creative and inspiring events” like this one to bring together artists and thinkers, politicians and entrepreneurs to engage with each other. We also heard from Humza Arshad, a British-Pakistani comedian and member of YouTube’s “Creators for Change” program. He uses humor on his YouTube channel to break down stereotypes about Muslims, prevent radicalization of young people—and get big laughs at the same time. 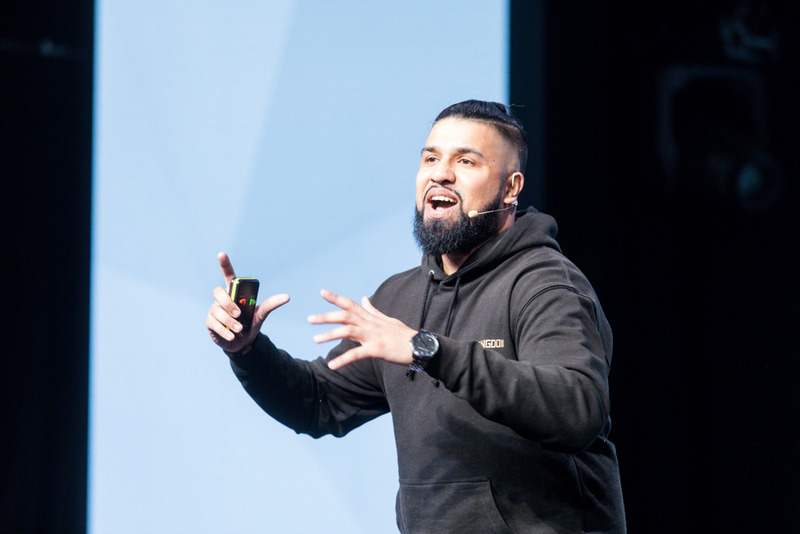 Humza is one of many creators using online platforms like YouTube to foster belonging, tolerance and understanding in unique ways. In fact, it was through recognizing YouTube’s ability to foster communities that we started Creators for Change last year. This global initiative supports creators who use their YouTube channels to tackle social issues and promote awareness, tolerance and empathy. YouTube is also a growth engine for creators. For a start, it helps artists like Ace Tee and Marina Satti reach a global audience, regardless of what language they sing in or where they come from. But the platform is also a unique tool for small businesses, like Nicole Tonnelle, the French beautician who has built her brand on top tips to look magnifique. She’s 65, but age is nothing but a number—just like 7 million, the number of views on her channel. The growth of her audience shows that today, it’s easier than ever for educators, artists and entrepreneurs to build a business. Alongside the event, we hosted a YouTube Space Pop-up—the first time in Belgium, after earlier outings in Rome and Stockholm. YouTube Spaces are places for creators to come together to collaborate, create and connect with one another. In a dedicated space at the BOZAR Centre for Fine Arts, hundreds of YouTube creators came together to polish their skills, establish new relationships, and produce content, while taking in workshops on topics from production fundamentals like lighting and lenses, to ideation and brand management. Finally, there’s the cultural impact of YouTube: Institutions like the city of Mantova, the Berliner Philharmoniker, Madrid’s Thyssen-Bornemisza Museum and the Castles of the Loire Valley are all sharing their treasures online, making this important heritage easier for anyone to explore. British Pathé has made 85,000 archive films available on YouTube, along with films from national audiovisual institutes across Europe, so history buffs and nostalgia enthusiasts have plenty to watch. For these creators, the YouTube platform is their global stage. Everyone who uploads their video to YouTube has access to a global audience of more than 1.5 billion monthly viewers in 90 countries. Creators use YouTube to amplify their voice, build their business, and share their passions with diverse communities around the world. As Justine Ryst, YouTube’s Southern Europe Partnerships Director, said: “Europeans are using YouTube to turn their creativity into a career.” And Europe on Stage is the perfect occasion to inspire the next generation of YouTube talent.